Smashed With Four Aces is one of my old paintings that I still love. 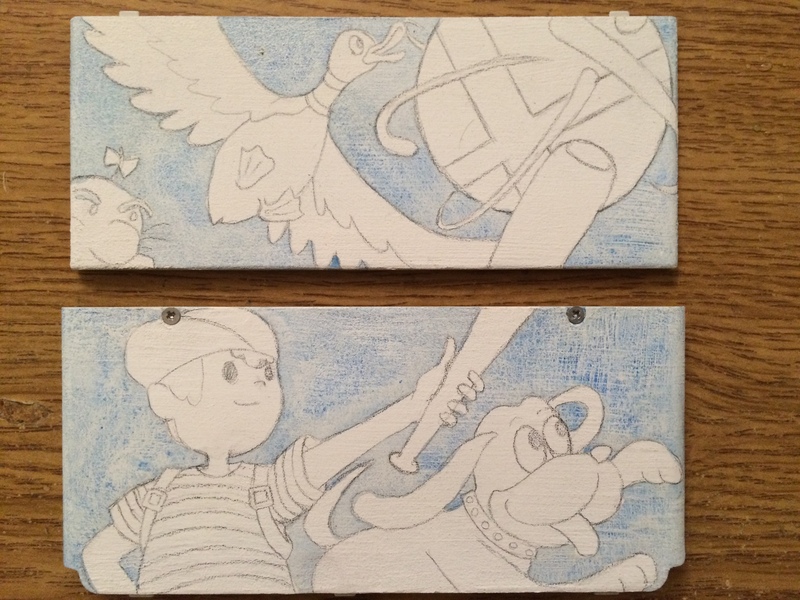 Sure it’s a cliche idea but I so enjoyed weaving a lot of easter eggs into the artwork, referencing both the original series of paintings by CM Coolidge and of course, the various titles that the dogs appear from. You can read all about the process of creating this art in an old blog post. One of the common critiques about the artwork was about Fox’s face. When I’d just completed the artwork I had trouble seeing it, then, over time the issues became really obvious but I didn’t find the time to address them. In some ways I was just so exhausted by the painting still (and the fact that my computer chugged whenever I opened the massive file). 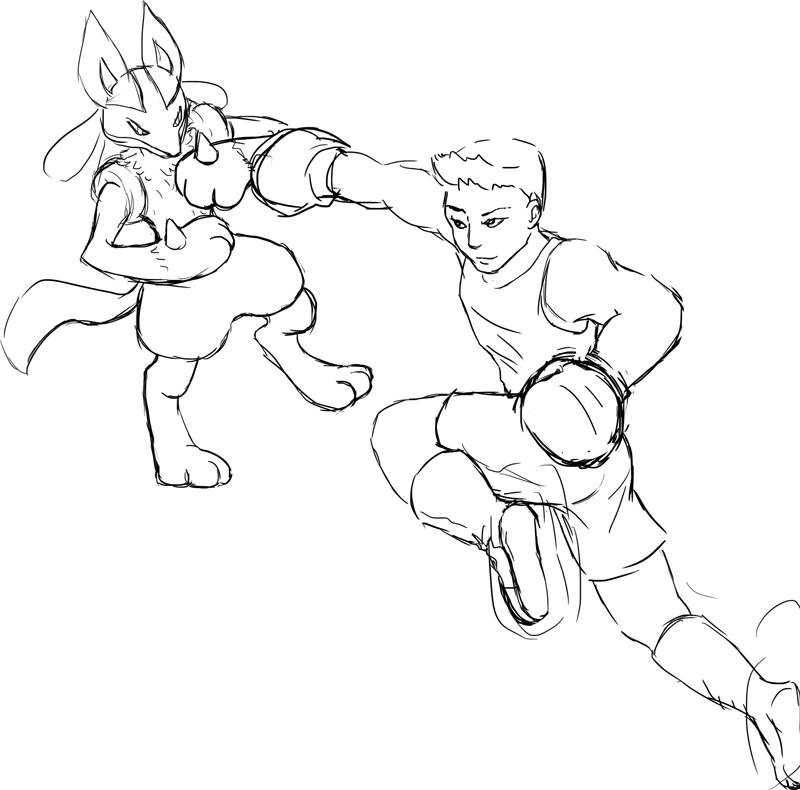 Mostly the problems emerged because I drafted Fox’s face after his Melee model, then swapped to his Brawl/Smash 4 partway through, trying hard to hew to the small snout, which didn’t really translate well. Now that I’ve decided to do a new print run of these posters I’ve been able to find time to fix up Fox’s face. Matching up to the colour sensibilities I had when I first painted this picture was difficult. It’s not perfect but I think it’ll do for now. 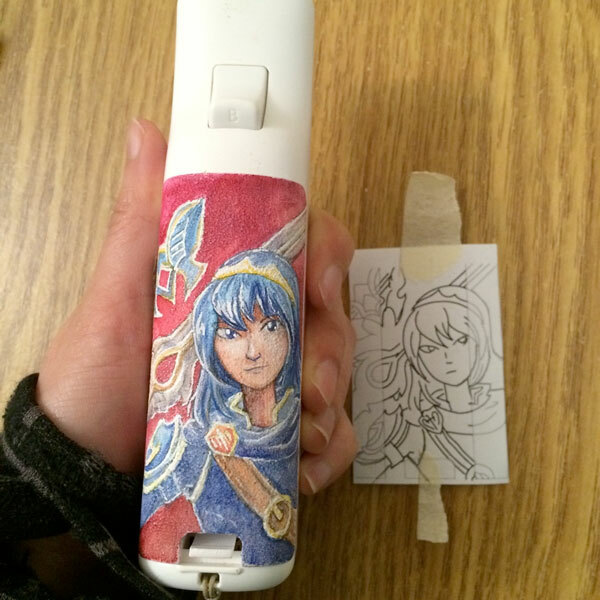 This custom Wii Remote cover features Lucina. 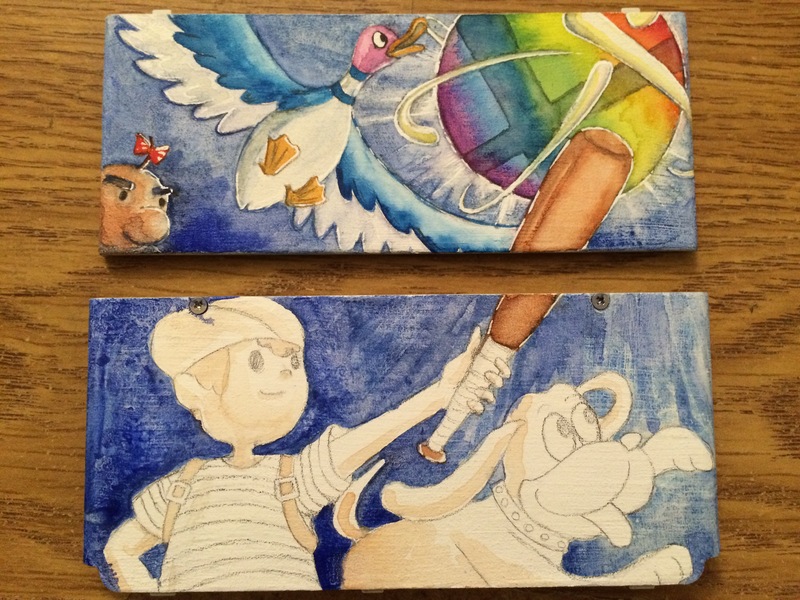 The technique I used to paint it was the same as the Splatoon covers I shared last week. In my pictures today I show the considerations I make about the inclusion of the sloped sides of the cover. I try to keep detail out of the sides and all of the main features to the middle. 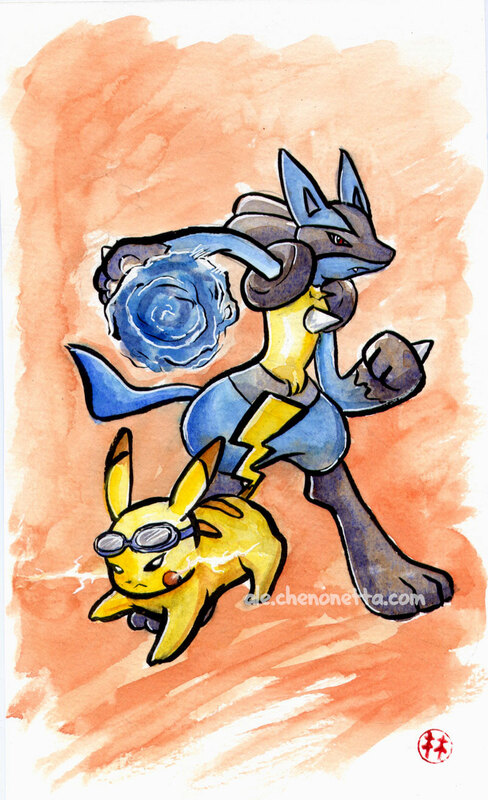 Lucario and Little Mac! 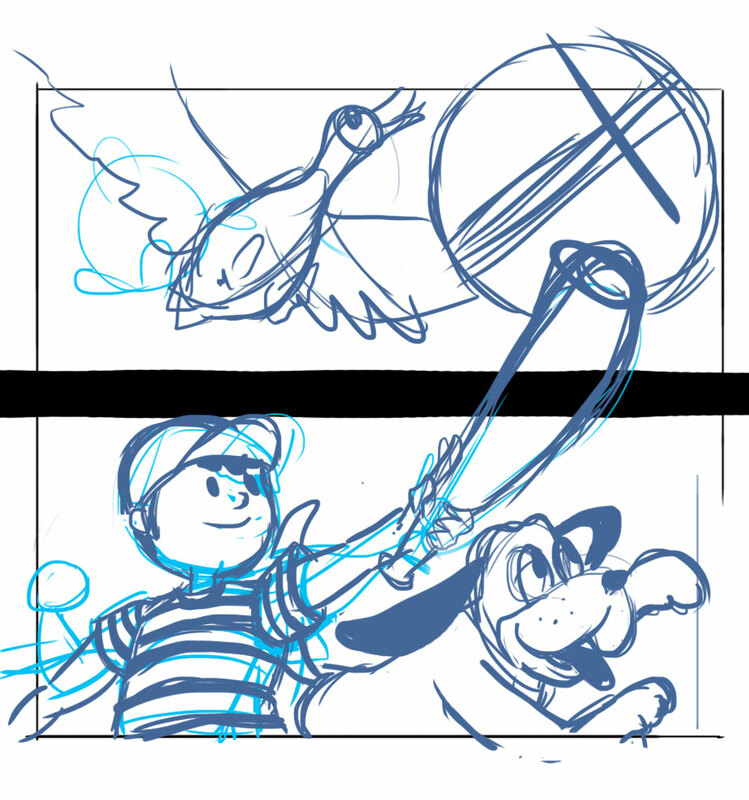 I think this was meant to be a prep sketch for a larger piece, but I abandoned it for some reason. The file has many layers with Little Mac in a few different punching poses. This is one of the more energetic ones. I drew this one after some early gameplay footage of Smash Bros for WiiU was seen. 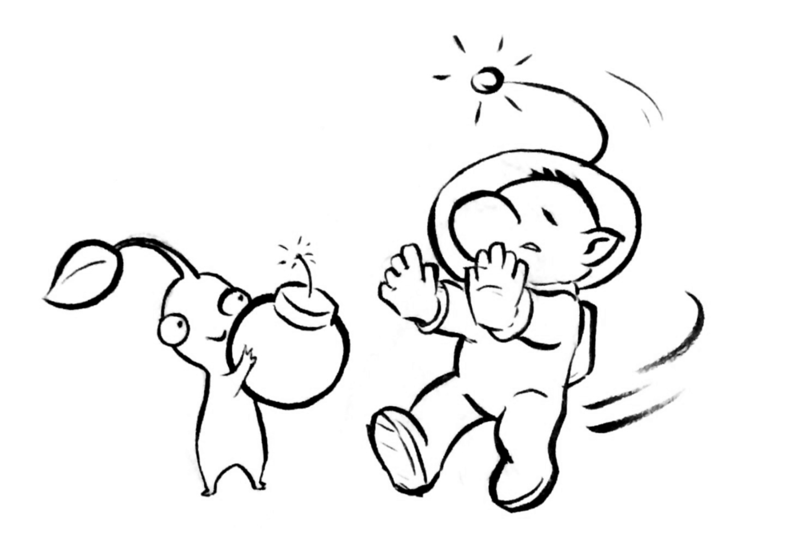 In it, people observed Olimar’s Pikmin bringing him items. 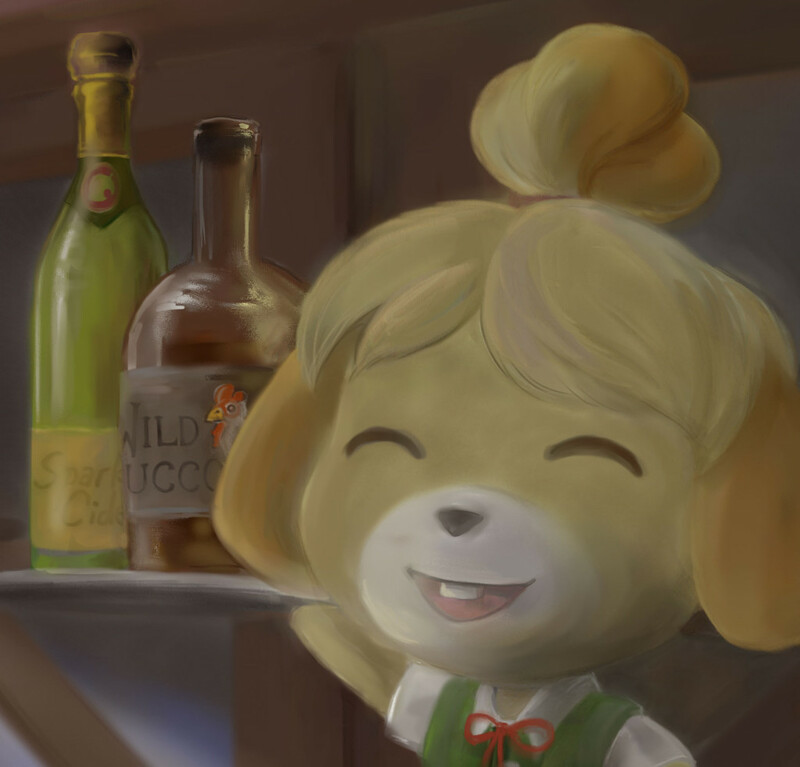 Someone observed it would be somewhat humorous if the helpful little guys brought dangerous items to Olimar! I have no idea how I forgot to draw in the bob-omb’s limbs and face. I had them pencilled in but when it came time to ink I just went into “it’s just a bomb” mode I guess. The background for this one ended up as a happy accident with the green gradient turning into purple by the bottom of the piece. 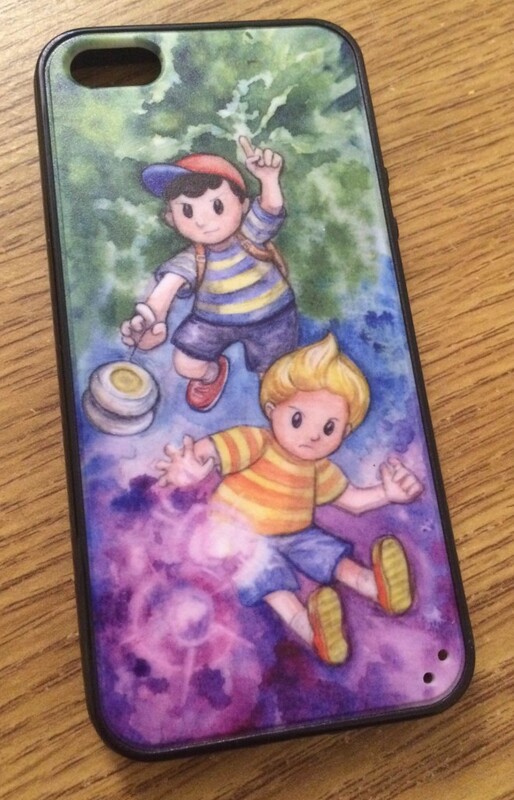 Also, I had a phone case with the design printed on it, I think it works quite well for the size and shape of the piece. I almost forgot to post today but I’ll squeeze in a post and backdate by an hour. Since it’s late I can’t really think of much to say along with the art, so enjoy. 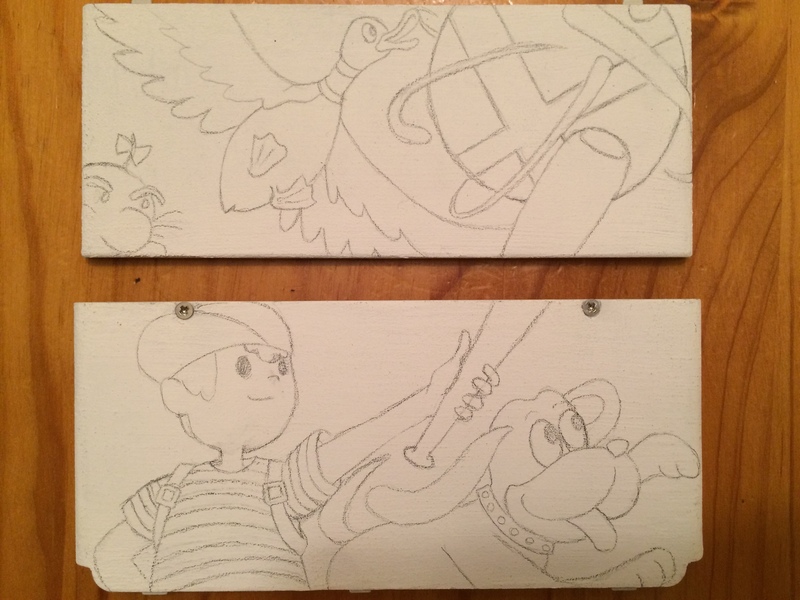 After Lucas’ announcement as DLC for Smash 4, everyone wanted to see more art of him! I was asked to draw him in his Grey alt-costume. I used this painting as a chance to experiment with some splatter effects. 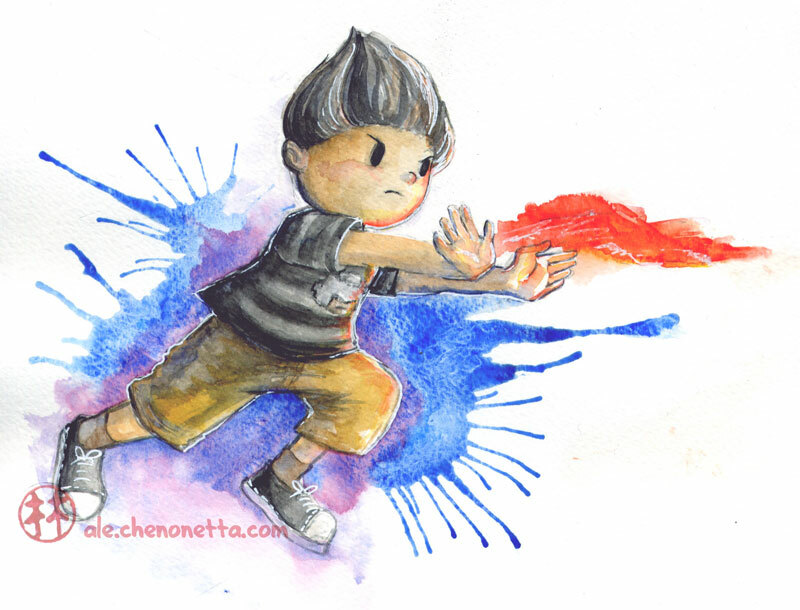 I put very wet washes of ink down around Lucas, then blew on the patches to make them splatter outwards. It’s tricky to control the results but I really like the effect that it provides. I hope to integrate it a bit more into some of my paintings. The plan for this week is to be posting mostly old art, and although I have been wavering on the idea I think I will go with it anyway just so I don’t end up in some kind of “but it’s old, I shouldn’t post it” mindset where I end up posting nothing at all. As always with Blaugust, it’s important to keep momentum up, so we’re heading into what I’ll informally call Smash Week. 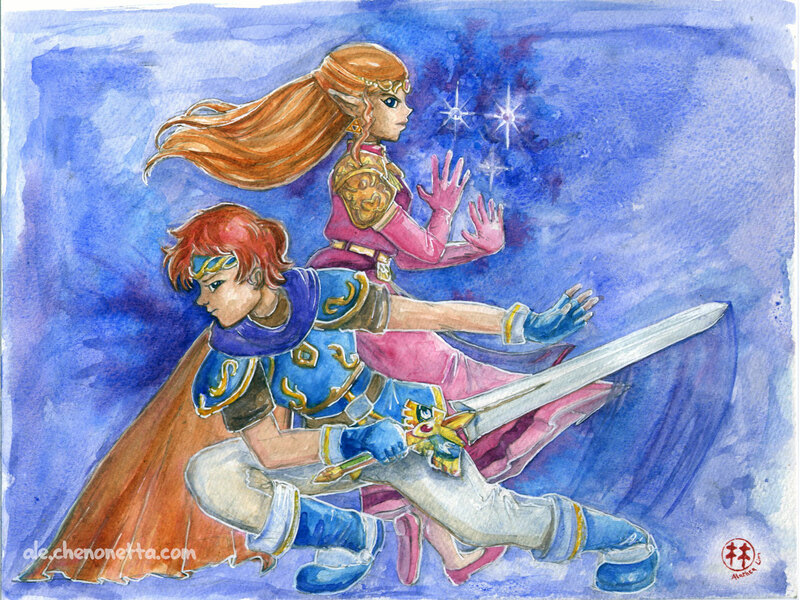 Tonight’s post is a painting featuring Roy and Zelda. 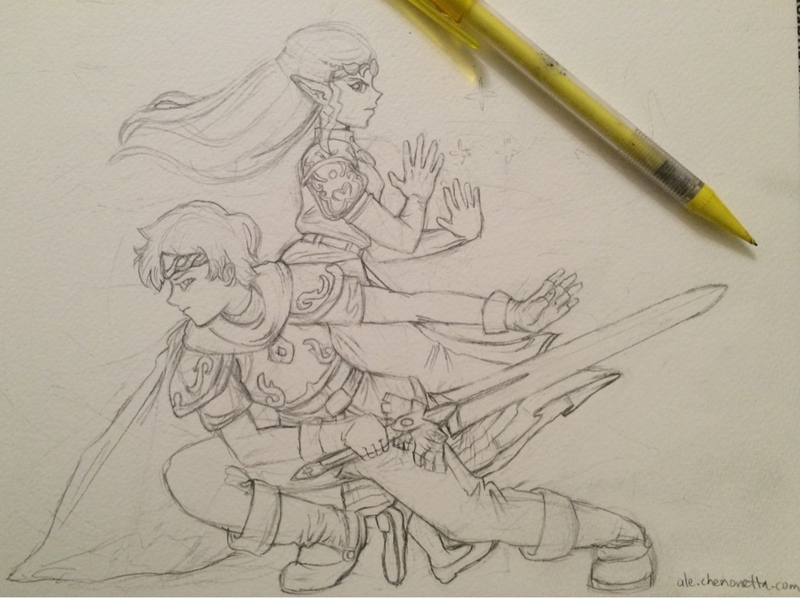 It was requested by a Project M player, hence Zenda appearing in her OoT costume. Actually I guess it’s what she would’ve worn in Melee too, so perhaps they were a Melee player. 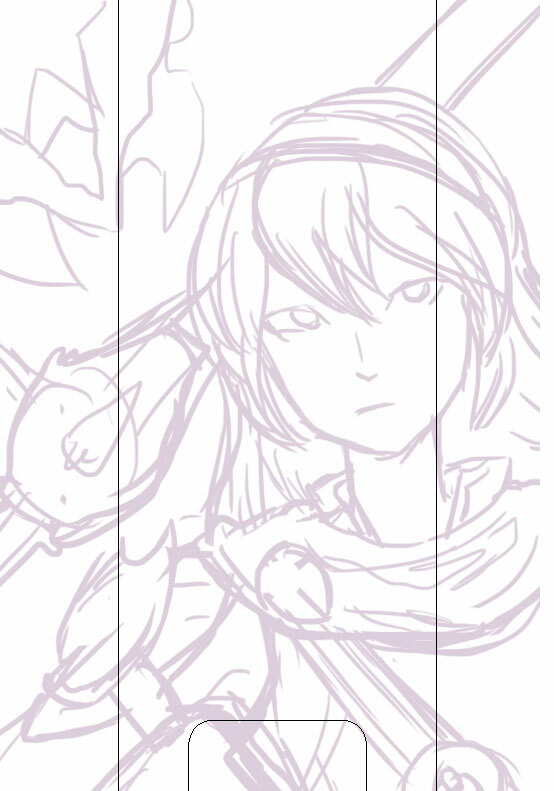 WIP sketch. I think some of the issues with this painting could have been avoided if I worked a bit larger. Some of the detail was hard to tackle. Bonus: There’s a Zelda player that goes by the name Cosmo, and a while back I spotted someone asking “Has Cosmo made a Zelda guide?”. My brain said I had to make this! 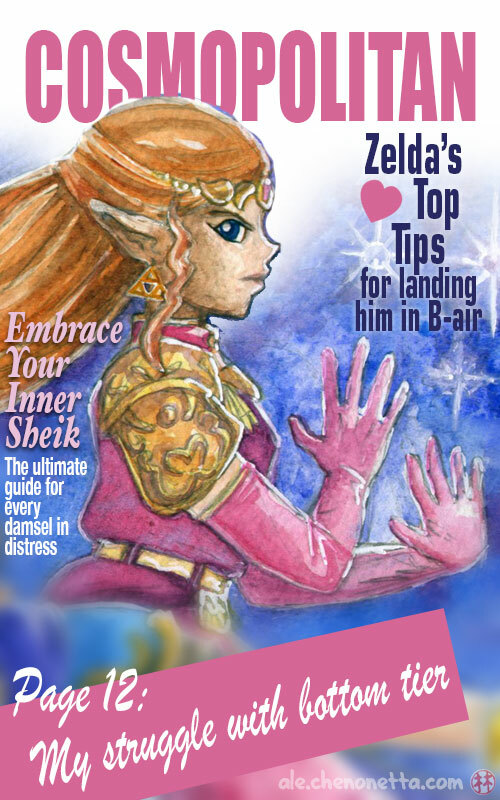 I kinda wanted to do a whole series with magazine articles that used awful vapid headlines that actually covered game mechanics in great depth, but it’s a pretty big time investment for someone who only dabbles occasionally in Smash. 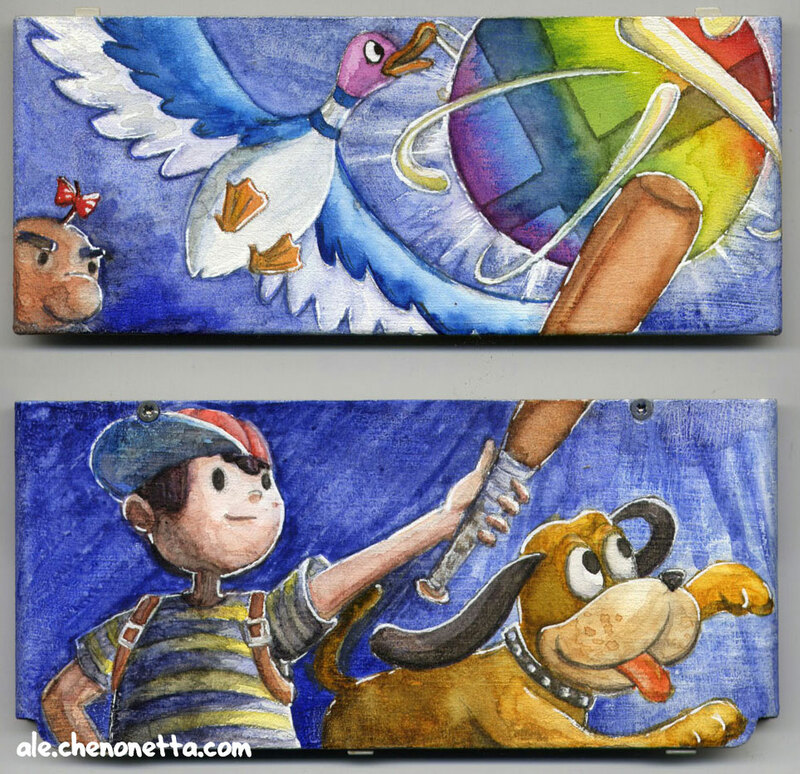 Despite the fact that I don’t have a New 3DS, I procured a set of blank cover plates and customised them with my Smash Bros mains! Part of the fun in composing this piece was determining how to design an image that would be engaging and interesting when split along the middle. I think this design works quite well, each half is interesting in its own right! 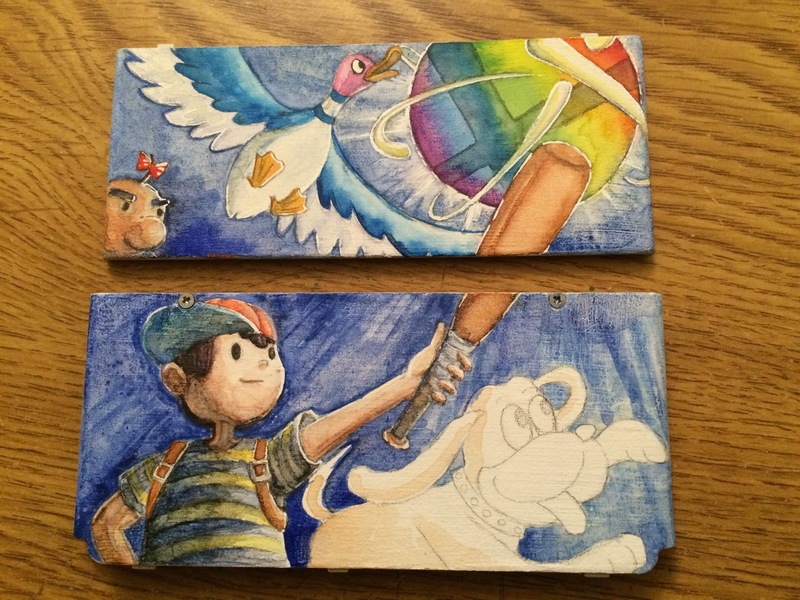 Here are some progress pics. 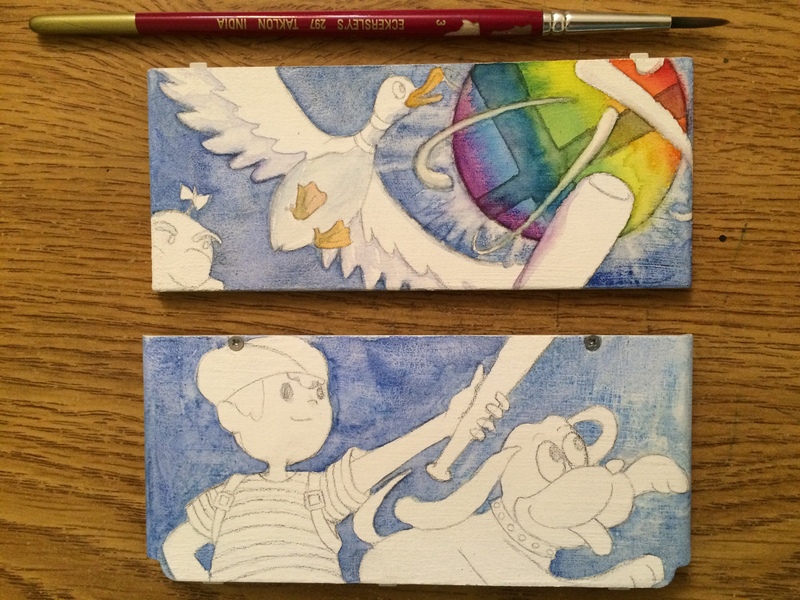 I started with a sketch and colour test in Photoshop before transferring the design to the cover plates, which were primed with Daniel Smith’s Watercolour Ground. It’s an interesting surface to work on – I found I had to be very careful when applying layers as reworking any area disturbed the layer beneath. It’s finally done! I don’t do a lot of digital art so although this painting got off to a blazing start, I quickly hit a wall and then it languished around for months because I found it too exhausting and physically straining to work on (digital painting hurts my wrists way more than traditional painting, plus my posture is bad). Well I’m super proud to say that I knocked down the wall and got this painting done. You can order prints of this painting in my Storenvy shop on TeePublic. Make sure you order a Poster or Canvas print to get the picture printing all the way to the edges! There’s also a t-shirt version available on TeePublic! It’s on sale for its first 72 hours, $14 now, $20 later. I can’t remember how the idea itself struck me, but the inspiration for this piece is quite obviously CM Coolidge’s famous series paintings of dogs engaging in human-like behaviour and pastimes. 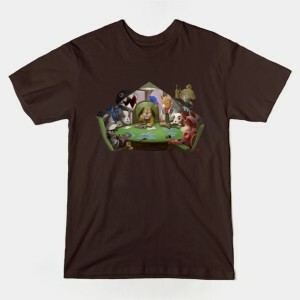 Many of these featured dramatic moments in games of poker. Render done in Blender to aid painting of the cards and chips. 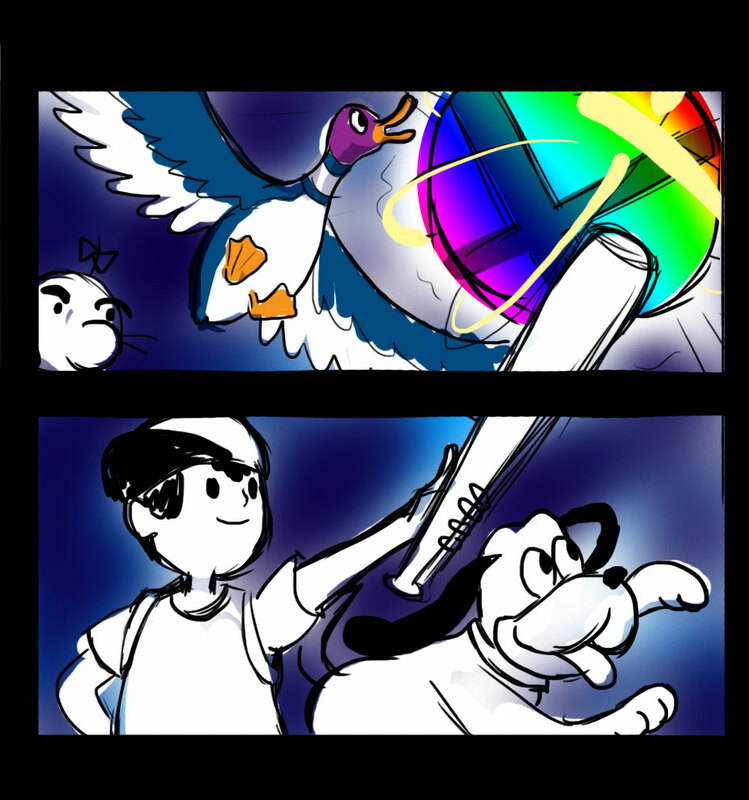 I knew that the feature of my piece would be the cheeky Duck Hunt Duo gloating over their winning hand. While the image most resembles the paired paintings A Bold Bluff/Waterloo The scenario is borrowed from Poker Sympathy and the general theme of the bulldog getting beaten even though he holds 4 aces (His Station and Four Aces, Pinched With Four Aces – the inspiration for the title of the piece). First up I had to determine who would be seated at the table and who the unlucky loser would be. 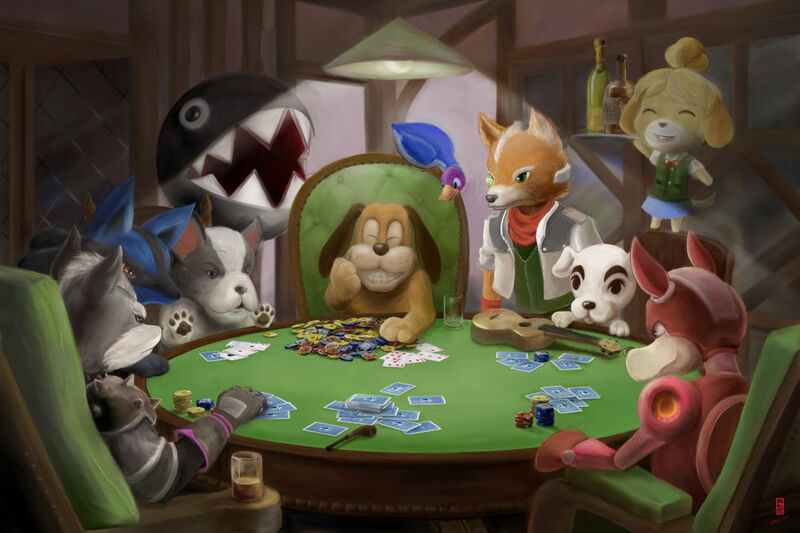 My inclusion criteria was pretty much any canid that appeared as a character, assist trophy or background element. I missed a few characters in the first pass and had to add them to the painting as I went. I thought about including Master Core’s beast form but letting in things that were simply beastly rather than canid would open the door to other things, like the Ultimate Chimera. Close up of Isabelle and the drinks she’s serving. 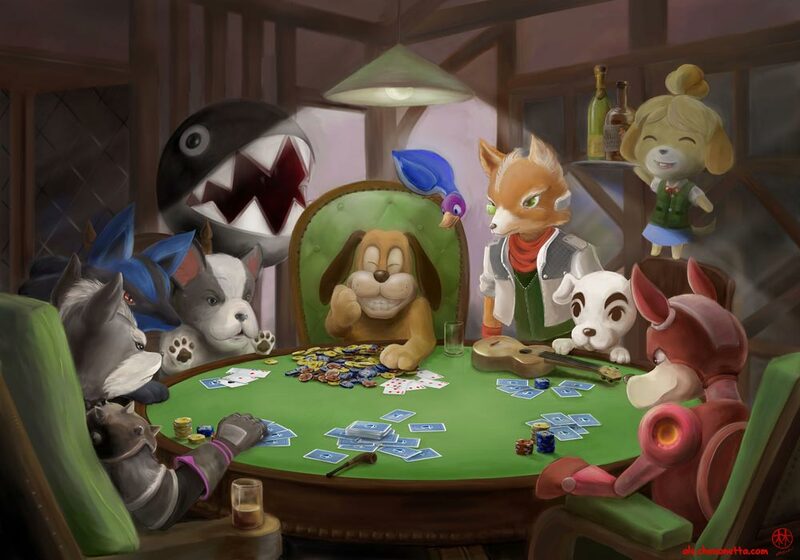 As for the loser – as luck would have it, Smash 4’s Nintendog was changed to be a bulldog. I think it’s a perfect match – the bulldog puts his hands up in protest, thus resembling his appearance as an Assist Trophy. I got the painting printed as a wrapped canvas print. It’s about 75cm x 50cm. I think the poster prints come out nicer though, they preserve the details a bit better.